Owner Michael Dubb leads World of Trouble with Manny Franco aboard to the winner's circle after the Carter Handicap. There were 5 graded stakes races run over the Aqueduct main track on Saturday. 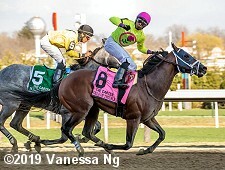 The only Grade 1 event on Wood Memorial day was the $400,000 Carter Handicap (G1) for older horses sprinting 7 furlongs and an early prep for the Breeders' Cup Sprint (G1). Breeders' Cup Turf Sprint (G1) runner-up World of Trouble was sent off as the 4-5 favorite in the field of 7. 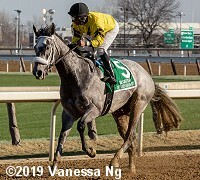 In to challenge him included 5-2 second choice Vino Rosso, winner of the Stymie, and 6-1 third choice Identity Politics, 2nd in the Malibu (G1). Down the stretch in the Carter Handicap. 13-1 Skyler's Scramjet and 15-2 fourth choice Honor Up dueled down the backstretch through opening fractions of 23.61 and 46.71 while stalked by World of Trouble and Vino Rosso. On the far turn, jockey Manny Franco sent World of Trouble 3 wide to sweep to the front through 3/4 in 1:10.41. Skyler's Scramjet closed the gap late but World of Trouble held him off by 1/2 a length in 1:23.28. It was another 1 1/4 lengths back to Honor Up third. 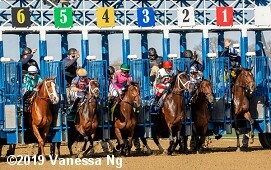 Left: World of Trouble in the winner's circle. 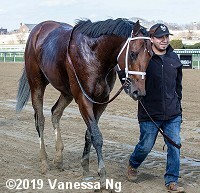 Winning trainer Jason Servis said, "He's a running son of a gun. He makes me look good. If I had a mare I would breed to him and the fact that he can do dirt and turf, I think we might go back to the turf. It would add some flavor to him as a stallion and then maybe back to the dirt so we'll see. [Skyler's Scramjet] is fast and I was getting a little nervous there towards the end. I'm just happy with today. My assistant, Henry Argueta, has been with me over 15 years and when I send him these good horses like Call Paul, Final Jeopardy and World of Trouble, I know I can sleep at night. He's the best." 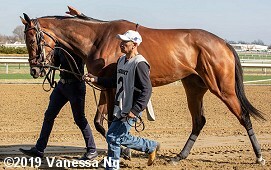 Right: World of Trouble walks over before the race. Winning owner Michael Dubb said, "He had horse the whole way. I knew Manny was comfortable and he knew [World of Trouble] was comfortable. 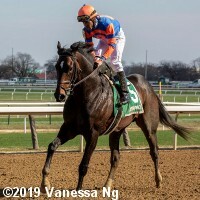 He could have gone at any time, but he was trying to leave 'some soap on the bar' so it was nice to pick up this graded stakes with him and we have a lot of options from here the rest of the year." Left: World of Trouble in the post parade. 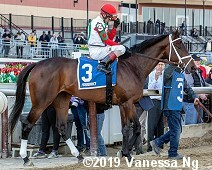 Winning jockey Manny Franco said, "Jason told me to break out of there and see how it developed, because we knew the 5-horse [Skyler's Scramjet] was going to go. We wanted to sit right off and it worked out great. He can be sensitive so I didn't want to get on him, and I think that was the key. I let him relax, and when I asked him to go, he was there for me." Right: World of Trouble returns after the race. Left: Second place finisher Skyler's Scramjet returns after the race. 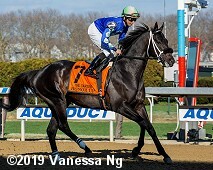 Jockey Rajiv Maragh said, "He's a good gate horse. He broke sharp from the gate. I just wanted to get him in a good flow down the backstretch. I didn't want to fight with him or grab him. He was just running so good early on, I thought I'd have a lot to finish with. He fought all the way to the end." Michelle Nevin, trainer of both Skyler's Scramjet and Honor Up said, "They both ran huge. I couldn't be happier with them. They got good rides from both jockeys and gave a phenomenal effort. We'll certainly move forward from here." Right: Third place finisher Honor Up in the post parade. 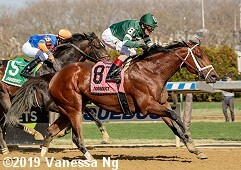 Jockey Jose Lezcano said, "We broke real well. We were right there the whole way. He gave me a very good race. He fought to the end. The better horse won the race." 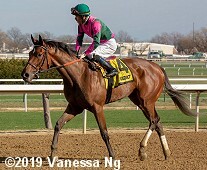 The filly counterpart to the Wood Memorial is the $300,000 Gazelle Stakes (G2) for 3-year-old fillies, also contested at 1 1/8 miles, worth 100 points to the winner as part of the Kentucky Oaks Championship Series. 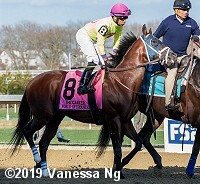 Busher winner Espresso Shot was sent off as the 9-5 favorite in the field of 6 over 9-4 Positive Spirit, 8th in the Rachel Alexandra (G2), and 15-4 Always Shopping, winner of the Busanda. 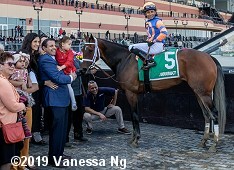 Jockey Jose Ortiz sent Positive Spirit to the lead first time by through fractions of 24.92, 50.09, and 1:14.95 while pressed by Always Shopping and stalked by 11-2 Off Topic. Entering the lane jockey Manny Franco sent Always Shopping to challenge, bumping with Positive Spirit through 1 mile in 1:39.69. Kept to task by Franco, Always Shopping pulled away late to win by 1 3/4 lengths in 1:52.91. It was a neck back to Off Topic third, while Espresso Shot checked in 5th. Left: Always Shopping in the winner's circle. Winning trainer Todd Pletcher said, "We felt that the mile and an eighth was in her favor. She's a rare horse that when you look at her figures, she's made an improvement in every start. There wasn't really any pace looking at the race on paper. It was one of those races where you had no really good idea of who would be on the lead. We decided to just let Manny [Franco] do his thing and he put her in a good spot. He said he felt like he had a lot of horse the whole way." 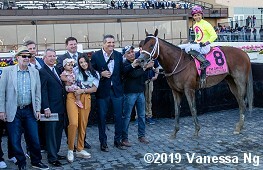 Right: Owner Mike Repole leads Always Shopping to the winner's circle with his daughter, Gioia, and his wife, Maria. 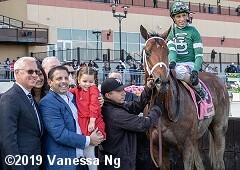 Winning jockey Manny Franco said, "I didn't see a lot of speed in there, so I just let my filly break out of there and get position before the turn. She took me there and I didn't want to get in her way, so I just left her there. She was there all the way for me. She's been doing everything right." Left: Second place finisher Positive Spirit returns after the race. 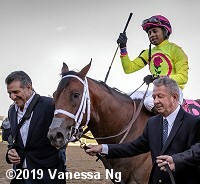 Jockey Jose Ortiz said, "She broke really alert. I was able to go to the lead and walk the dog as long as I could. When I felt Franco coming by the three-eighths pole I said 'I've gone easy enough, I've got to go on.' I went on, he went on, and he beat me." Right: Third place finisher Off Topic heads out for the post parade. 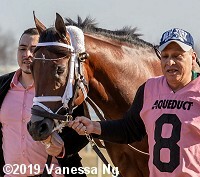 The Todd Pletcher trainer improved her record to 1 win, 2 seconds, and 2 thirds in 6 starts, earning $105,900 for owner Paul Pompa Jr.
Left: Fifth place finisher and beaten favorite Espresso Shot walks over before the race. 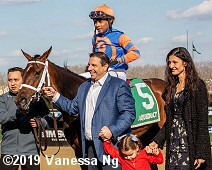 The Jorge Abreu trainee has a record of 3 wins, 1 second, and 1 third in 7 starts, earning $274,975 for owners NY Final Furlong Racing Stable, Maspeth Stables, and Parkland Thoroughbreds. Right: The horses break from the gate for the Gazelle. 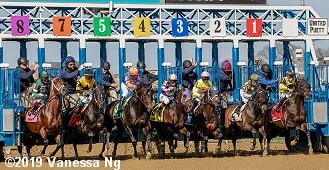 The $150,000 Excelsior Stakes (G3) featured a field of 7 older horses going 1 1/8 miles on the main track. 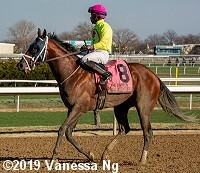 After last year's winner Discreet Lover was scratched, Gio Ponti Stakes runner-up Life's a Parlay was sent off as the 3-2 favorite over 2-1 Monongahela, 2nd in the John B. Campbell at Laurel, and 5-2 Nicodemus, an allowance winner last out. Jockey Carlos Hernandez sent 32-1 Hit It Once More to the lead first time by through fractions of 23.48 and 47.38 while pressed by 14-1 Tour de Force and stalked by Life's a Parlay. On the far turn Tour de Force gained a short lead from the tiring Hit It Once More through 3/4 in 1:12.10. Jockey John Velazquez sent Life's a Parlay 4 wide to sweep to the front through 1 mile in 1:37.43. Monongahela put in a late rally from 4th but Life's a Parlay easily held him off by a length in 1:51.54. It was a neck back to Tour de Force. Left: Life's a Parlay in the winner's circle. Winning trainer Todd Pletcher said, "He runs well every time. We shipped him to Oaklawn and ran there; shipped him back to Florida and came up to New York all in three weeks. It was a lot to ask of him, but he's been training well. 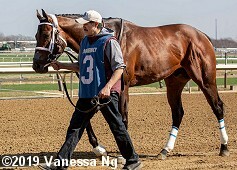 He had a nice breeze the other day, so we felt confident that he bounced out of his last race in good shape. I think there's a little more in the tank. He has a tendency to idle a little bit when he gets to the lead like he did today, but I was proud of him for doing it. I think today confirmed that we can get a mile and an eighth and maybe a little further." Right: Life's a Parlay heads back to the barn. 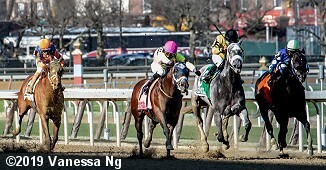 Winning jockey John Velazquez said, "I had a perfect trip. There were two speeds in the race, Mike [Repole] had another horse [Tour de Force] in there and I knew [Hit It Once More] normally gets sent out of there, so it worked out perfect to let them go and sit behind the pace. This horse is better than I think he is but when he gets to the lead, he waits. He sees everything in front of him and I have to wait for the horses to come to him for him to run again. He is very talented." Left: Second place finisher Monongahela walks over before the race. 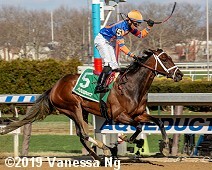 Jockey Jose Lezcano said, "I had a good trip. I got the position I wanted, and he ran a very good race. At the quarter-pole, I had to wait a little longer than what I wanted but when I got out I still had plenty of time to go on and win the race, but [Life's a Parlay] just kept going." Right: Third place finisher Tour de Force returns after the race. The Rudy Rodriguez trainee improve his record to 4 wins, 3 seconds, and 2 thirds in 17 starts, earning $171,924 for owner Mike Repole. The horses break from the gate for the Excelsior Stakes.